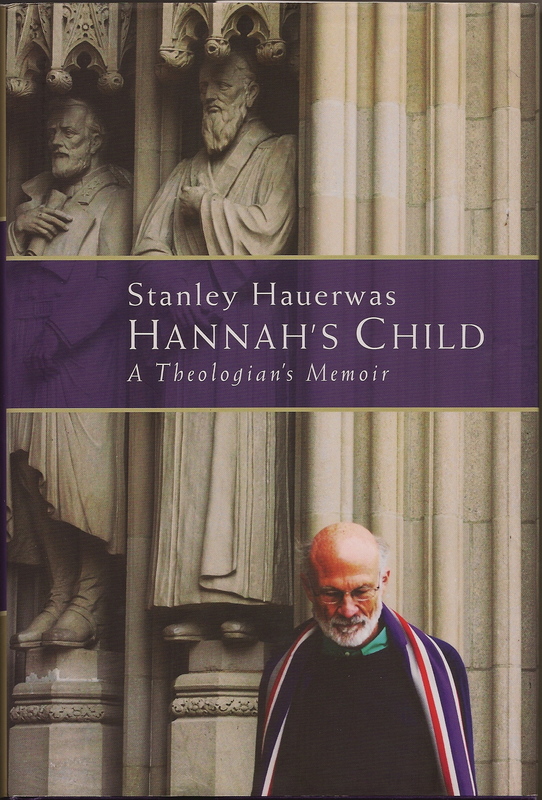 This entry was posted in Books and tagged Hannah's Child, memoir, Stanley Hauerwas by doradueck. Bookmark the permalink. I wonder why she didn’t call him Samuel. Thanks for this review, Dora. I have met Stanley several times in person and liked him a lot. I also like your line above about life writing–that we look for honesty and grace, not perfection. So true. Samuel Hauerwas does have a rather nice ring to it, doesn’t it? He says in the book that he was named Stanley because the week before he was born his parents saw a movie — “Stanley and Livingstone.” Thus, arbitrarily, are some children named! — I read somewhere that everyone who’s met him has their S.H. “stories” and perhaps you do too. He comes across as something of a character, but a lovable one. It’s so true. I discover what I believe by expressing it. Today someone else told me that hymns work that way for him. He may not believe something, but as he sings it over and over, it works a groove into his spirit and he finds himself believing more and more. Yes, there’s definitely something about “practice” leading the way. Thanks! The impatience and slowness of knowing “how to be a Christian” resonates with me. Thanks again for posting Dora. I too love your sentence about about life writing that said..we look for honesty and grace in life writing, not perfection. That certainly gives me hope for my own struggle with my writing. I’m not sure about the grace but I’m certainly focused on finding my truth in all the words. Dora, and all other readers, commenters, I want to bring to your attention the book City of Tranquil Light, which tells the story of MB missionaries to China 1909-1960’s. http://www.amazon.com/City-Tranquil-Light-Bo-Caldwell/dp/0805092285 Note that the publication date is Sept. 28. I am sure that the publisher would send you a copy if you promise to review it here. You are my MB blogger contact, so I thought I would share. I loved the book and would love to help it find its rightful, large, audience, beginning with those who might know most about the origins of the characters. Thanks for the heads up on this, Shirley. I look forward to reading it. I understand it’s a novel but based on some real characters? Yes, based on the lives of her grandparents, Peter and Anna Schmidt Kiehn, and using memoir/biographical resources from Margaret Epp, Nellie, Henry, Paul, and Ina Bartel. I expect to get several copies from the publisher and will send you one of them if you want to read and review. You are my online window into the MB writer world, and I thought of you as soon as I started reading this book. Hi Shirley, I’ve had an email directly from the publisher, so will get my copy that way. Thanks, though! Great! Glad they found you directly. Eager to read what you think.